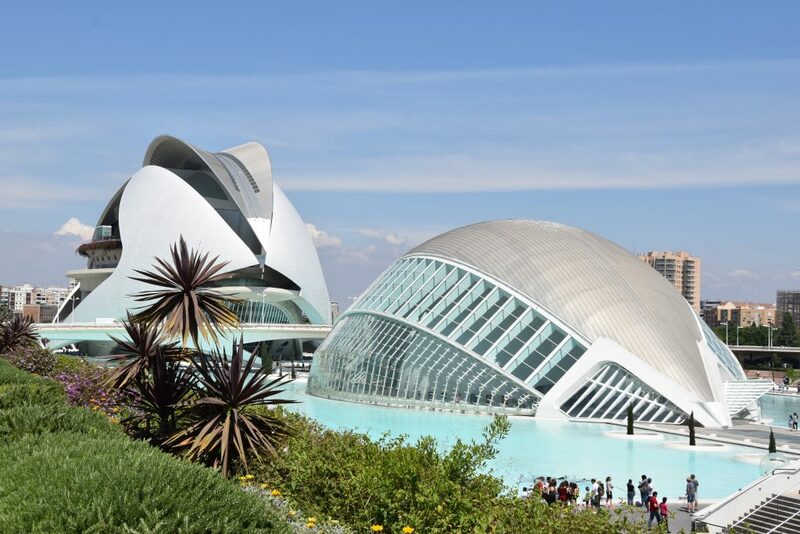 Valencia is getting more and more popular as a destination for a city trip. It looks like it will even become more poplar than Barcelona! Although I love Barcelona as well, it’s easy to see why Valencia is so popular. It’s a beautiful city with nice old buildings, delicious food and many sunny days. 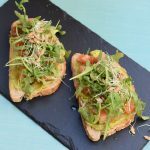 You can read all about my favorite vegetarian-friendly food spots in Valencia in this blog post. 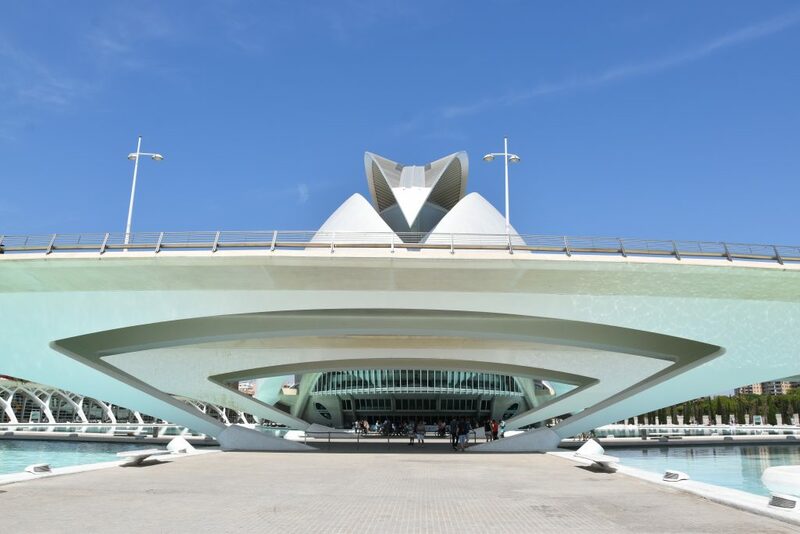 Or continue to read what you can see and do in Valencia. 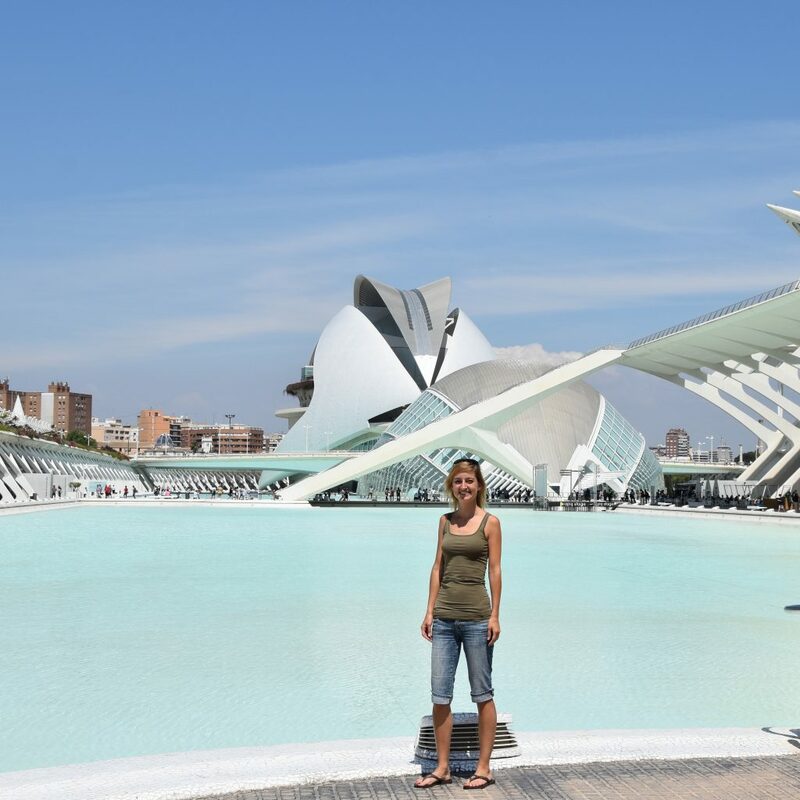 All my top sights and activities in Valencia on one page! 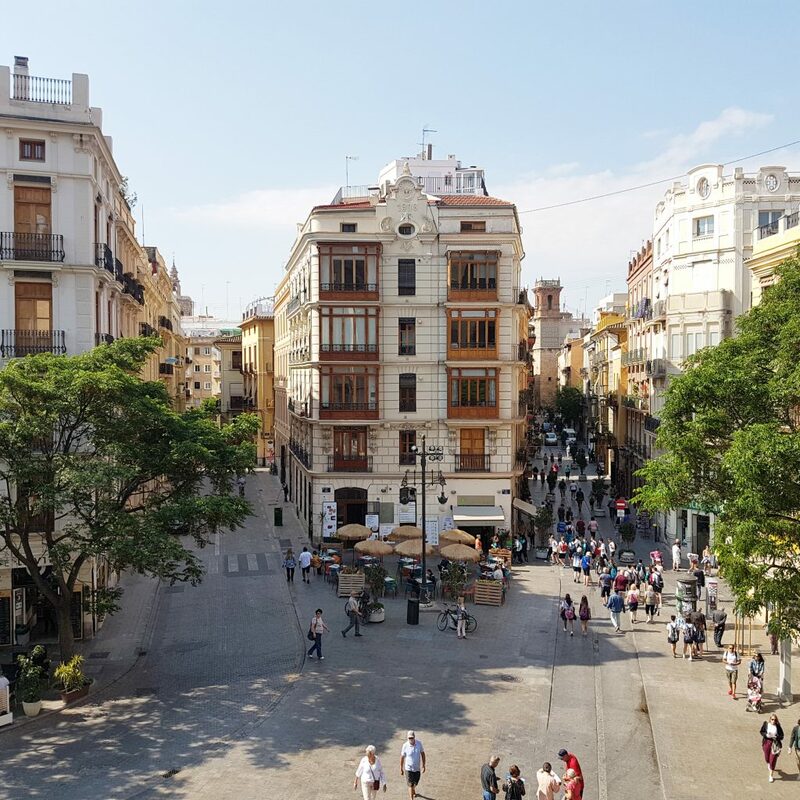 The part of Valencia with the most attractions is the Old City. It’s the area North of the train station and South of the dried river bed. Try to book your accommodation in this area and you’ll be very centrally located with almost everything in walking distance. 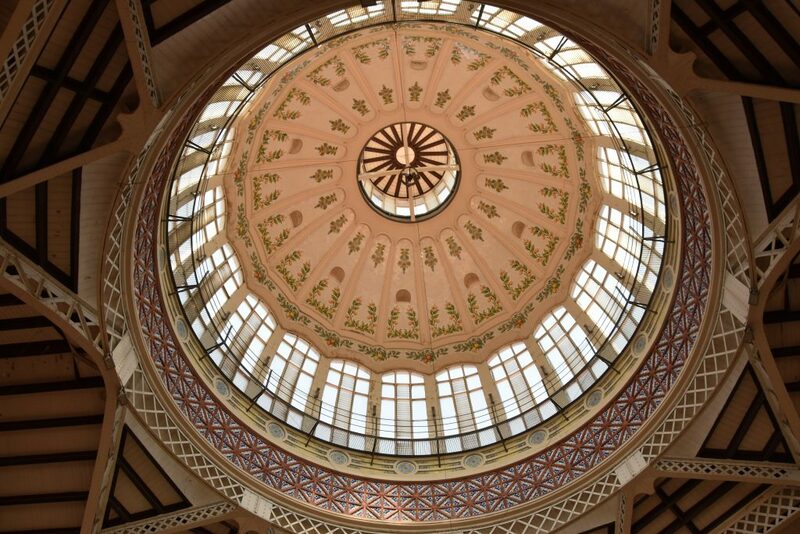 In this area you’ll find the big Valencia Cathedral and the Basilic with the beautiful painting on the ceiling of the dome. 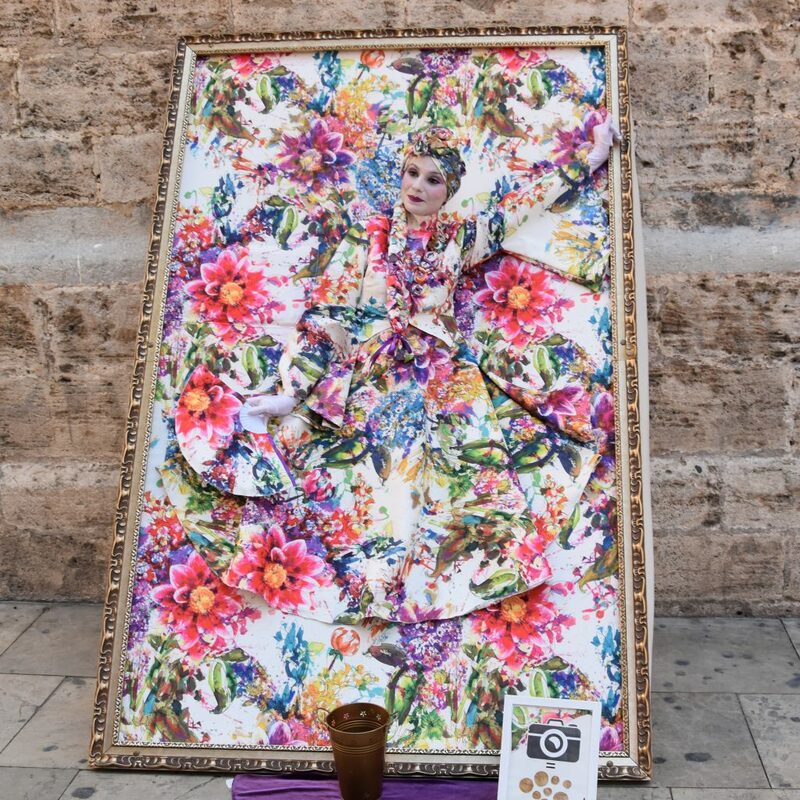 In the streets surrounding the Cathedral you’ll find street musicians and living statues. Can you spot the lady in this picture? On the Northern border of the old city you’ll find Porta de Serrans (pictured) and on the Western side you’ll find Torres de Quart. Two Gothic-style towers that are part of the old city walls. They’re free to enter and you’ll have great views over the city. 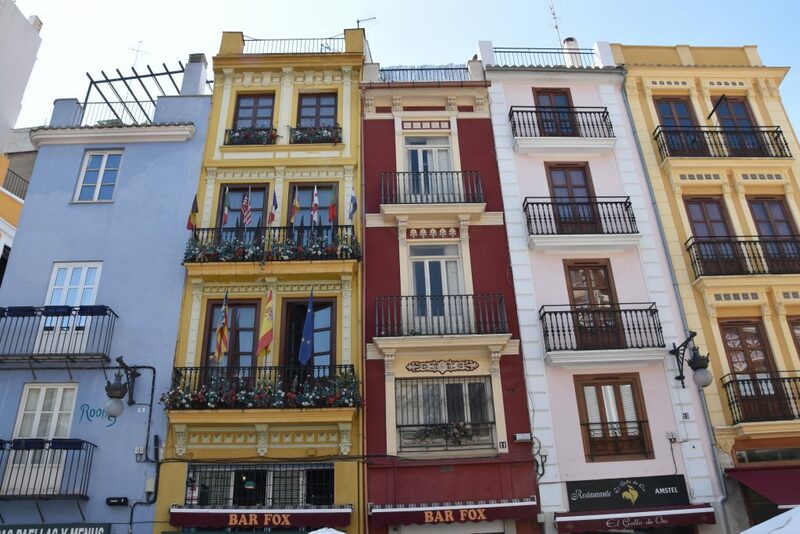 Below you’ll see a picture of tapas restaurant La Maruja that I took from Porta de Serrans. 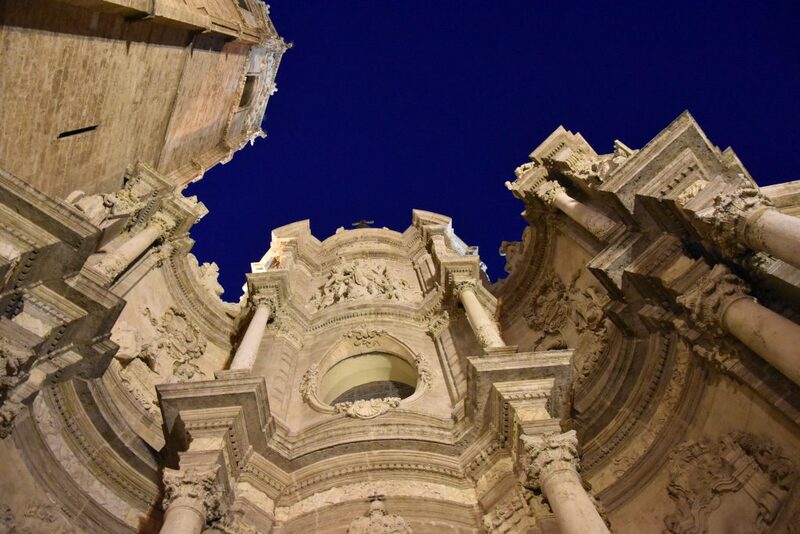 Speaking of towers, every day from 11 to 1pm you can visit the Clock Tower of the Esglesia de Santa Caterina (close to the Valencia Cathedral). 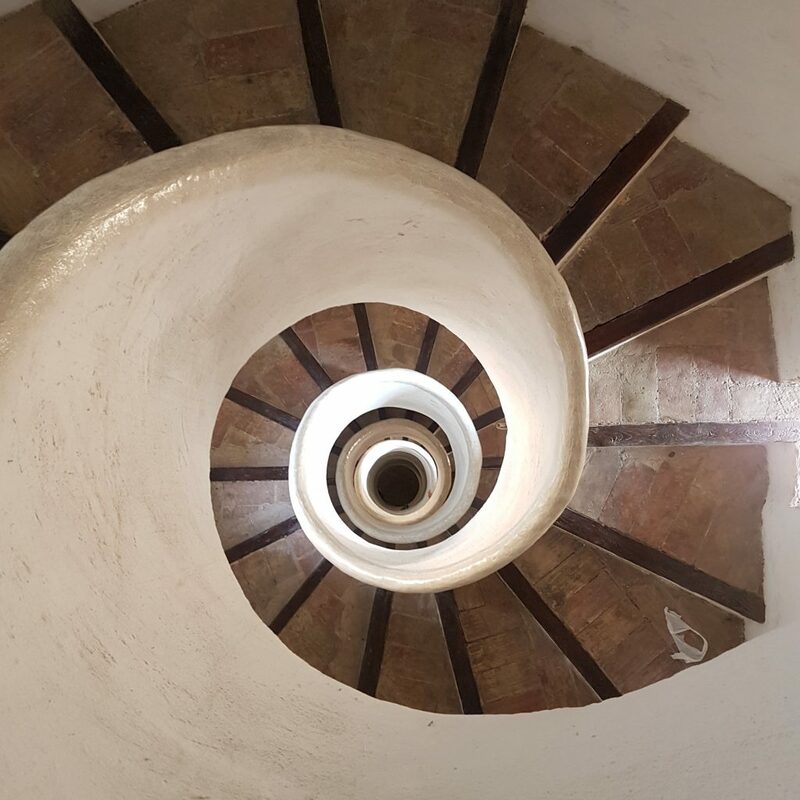 Walk up the spiral staircase and enjoy the view. 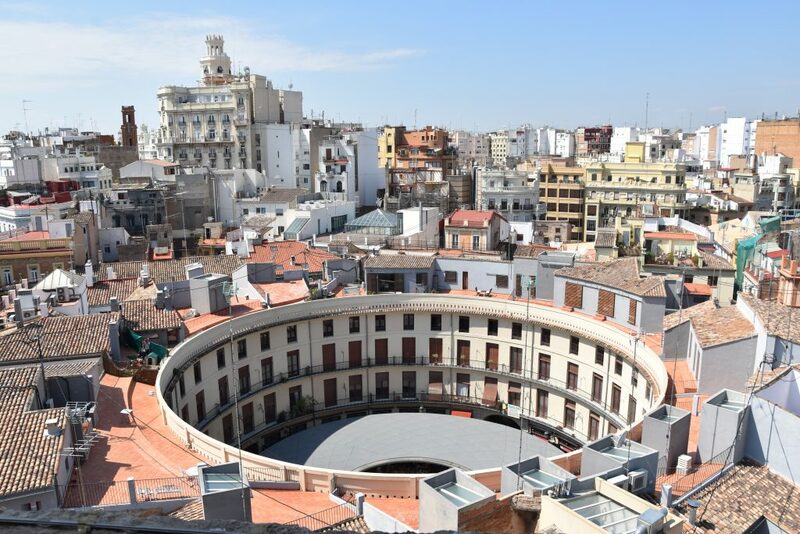 You can see Placa Redona, the partly covered round market square from above! 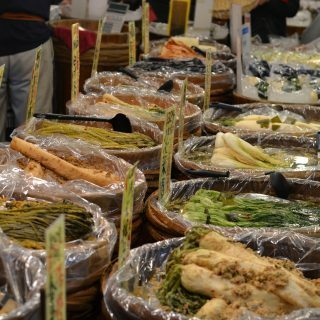 This central market is the biggest covered market from Europe and they sell all kinds of things like fruit, vegetables, bread, spices meat and fish. Many tourists visit it and all the locals buy their groceries here. Perhaps you can gather some ingredients for a picnic and otherwise just admire the colors, smells and sounds. At the time of our visit there was an amazing exhibition at Centre del Carme. It’s a great cultural centrum anyway as it’s located in a 13th century convent. 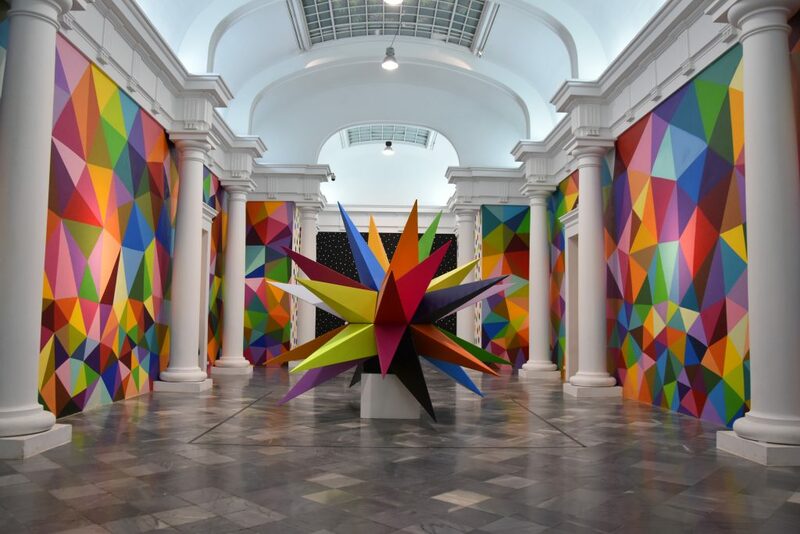 But when I was there, there was an exhibition from Okuda San Miguel. 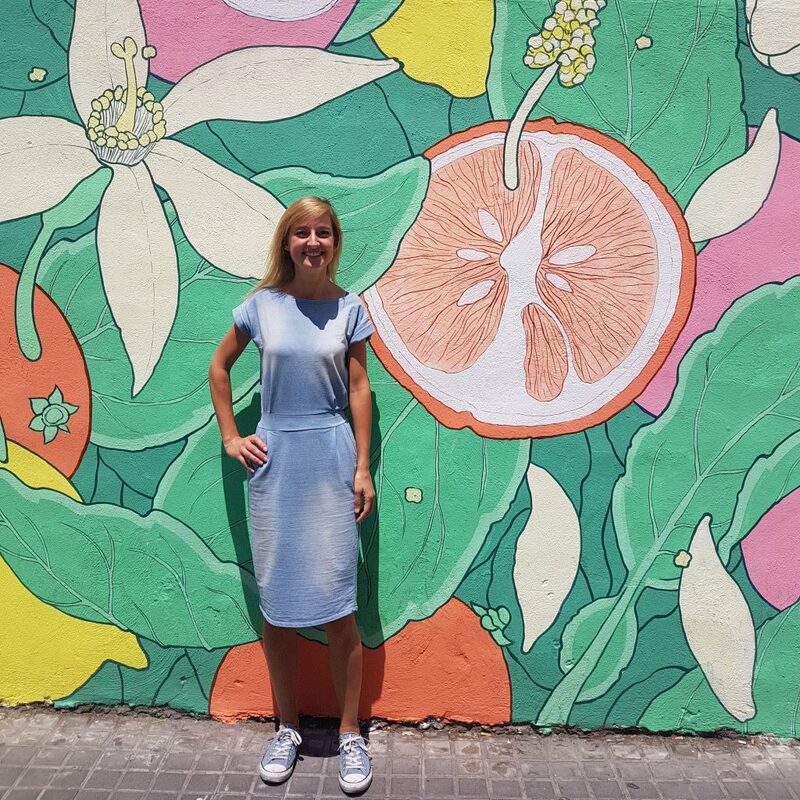 This very colorful street artist even painted the walls of the museum in colored geometric shapes. Unfortunately, the exhibition already ended. 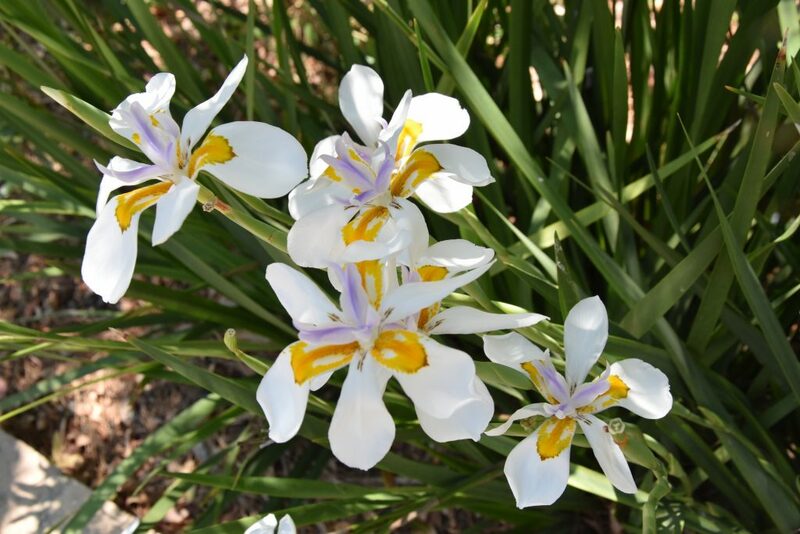 The botanical garden from the University of Valencia is a wonderful park to stroll around and to discover many new trees and flowers. 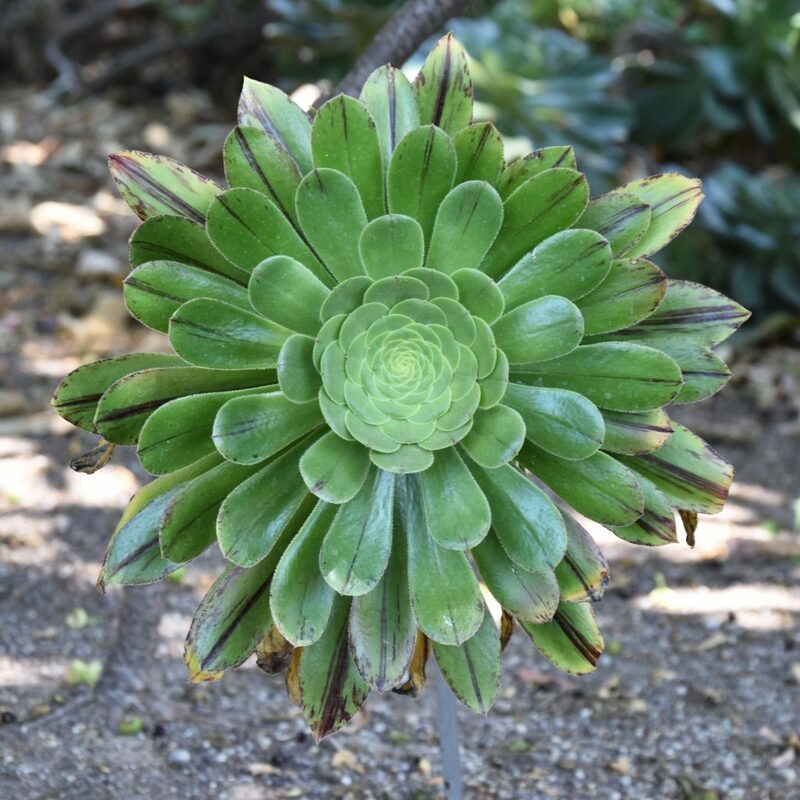 Be amazed by the variety of cactuses, discover frogs in the pond or check the medicinal power of herbs. 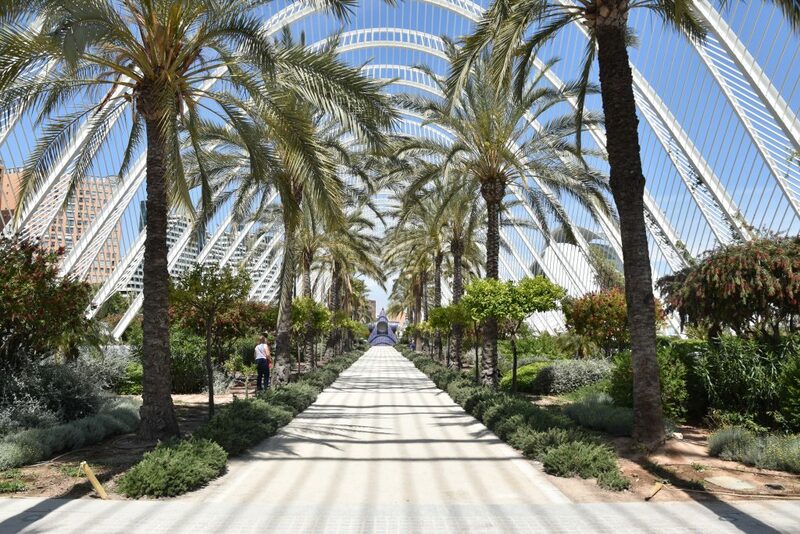 The botanical garden is also a great place to visit when it’s warm in Valencia as it has many areas with shade. Throughout Valencia and especially in the old city you’ll find many graffiti works. Some of them are real works of street-art. Don’t be afraid to take a small side-street as those are the streets where you’ll find the best graffiti. 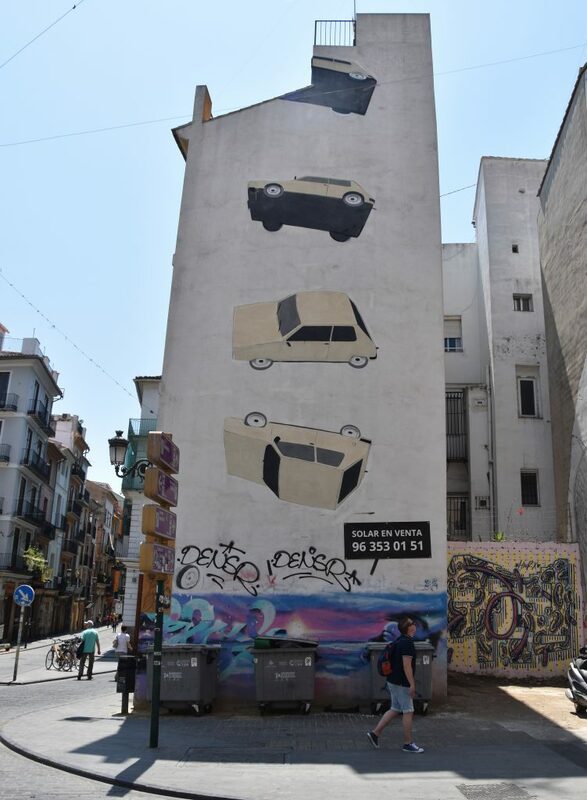 These tumbling cars can be found between the Mercado Central and the Torres de Quart. 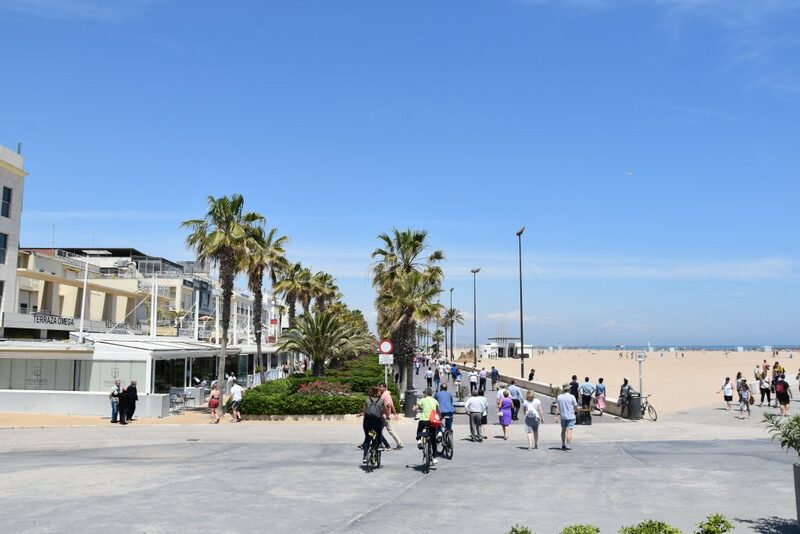 About 5km from the Old City you’ll find Valencia’s Beach. You can walk there via the dried river bed but it’s also a great destination to travel to by bike. Everywhere in the city are bike rentals and for about 5 euros a day you can rent your own bike. There are many cafes and restaurants lined at the boardwalk. I recommend La Pepica for (vegetarian) paella and Panorama Restaurante for wonderful views of the blue sea. 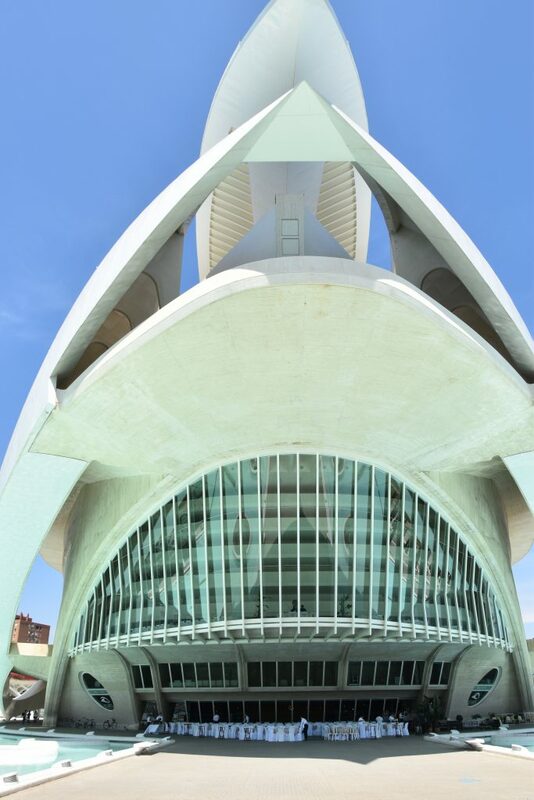 The icon of Valencia and the most popular spot for photographers. 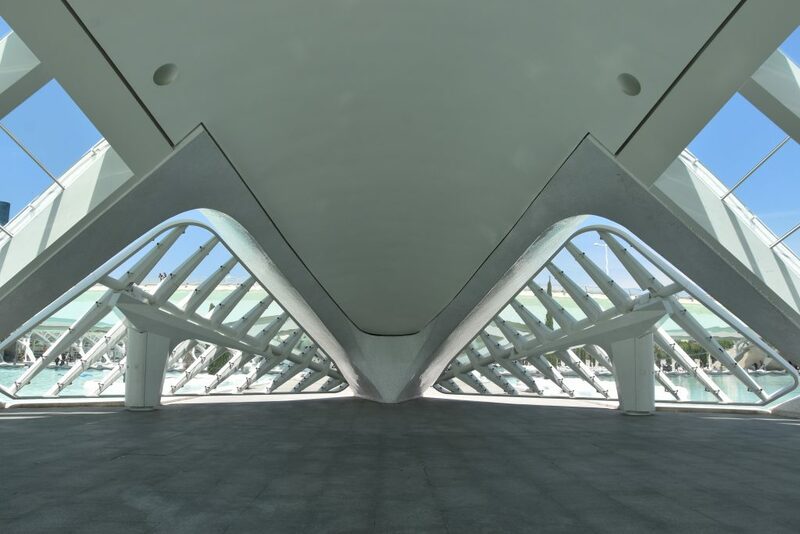 CAC stands for Ciutat de les Arts I les Ciencies (City of Arts and Science). I could spend hours here photographing all the geometrical shapes and the bright colors of the white building and light blue water. You can walk around all the buildings and visit the garden on the first floor. When we were in Lisbon I used my Time to Momo travel guide on Lisbon a lot. What I like about the Time to Momo guides is that they divide the city in walking routes. 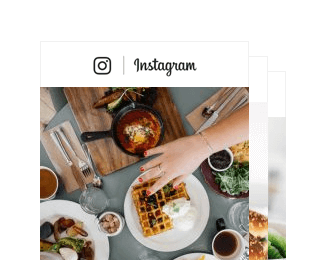 They give you tips on good food spots, but also on sights and museums. 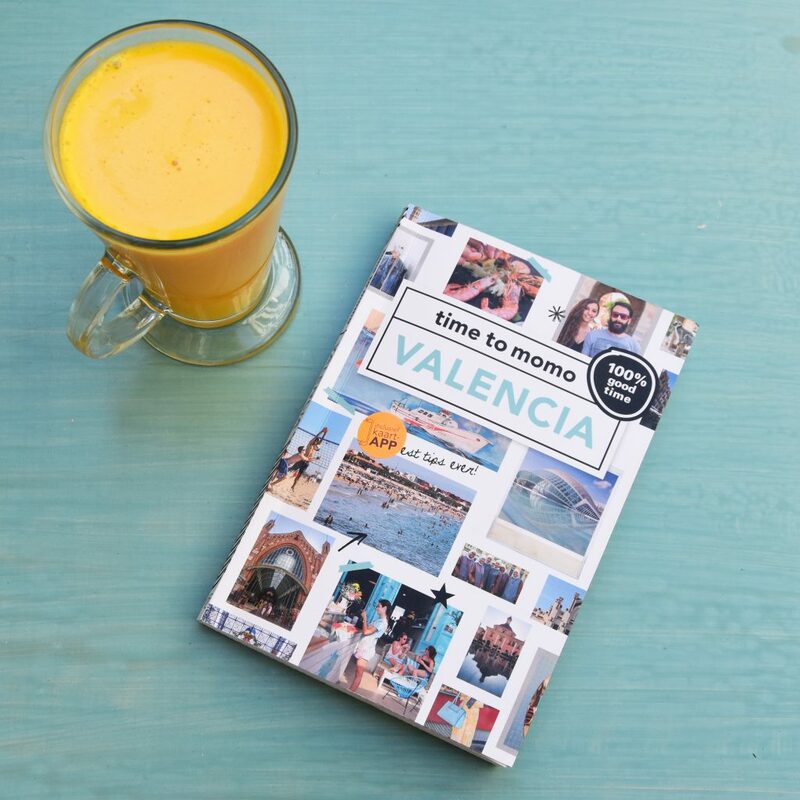 You can order the Time to Momo Valencia guide here. 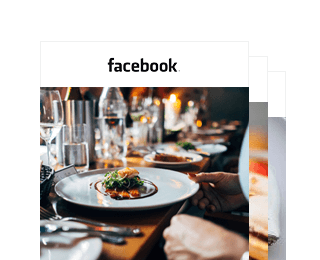 Hungry after all the sight-seeing? 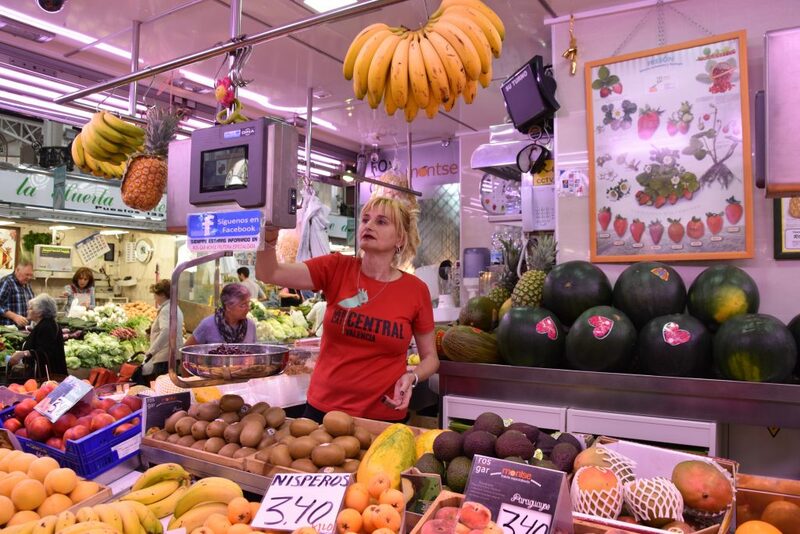 Check my food favorites in Valencia here. 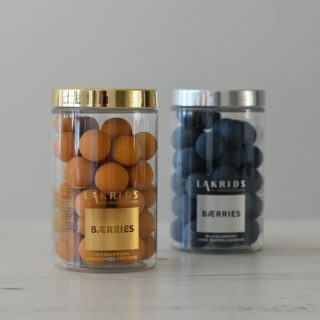 Like Spain? 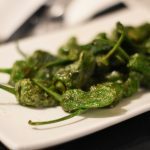 You might also like my travel blog to Barcelona or Madrid. 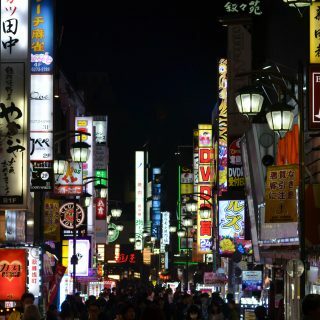 Tokyo on a budget: activities you can do and si ..
Boerschappen: your groceries straight from the ..